Previous Weekly Briefing: ​Is This Change Real or Just Another Prediction? NEW YORK, NY (October 28, 2014) – A+E Network®'s HISTORY® Channel will partner with the University of Oklahoma to offer the very first TV Network-branded online course for transcripted college credit or for the lifelong learner. HISTORY® Channel's United States, 1865 to the Present course enrollment will launch on October 28 at History.com/courses and will be taught by award winning teacher, OU professor, and renowned historian Steve Gillon. The announcement was made today by Dan Suratt, EVP, Digital Media, A+E Networks and University of Oklahoma President David L. Boren. United States 1865 to the Present will provide a unique, engaging and interactive way for college students to earn three transcripted credits, and life learners the opportunity to learn U.S. History from one of the country's leading institutions of higher education. The groundbreaking 16-week interactive, immersive course, which will be offered during the Spring Semester, officially begins on January 12, 2015. Utilizing the strengths of both HISTORY® Channel and OU, "United States, 1865 to the Present" has been rigorously designed by an academic team from OU and will be taught by Professor Steve Gillon, the scholar-in-residence at HISTORY® Channel and professor at OU. Combining professionally-produced and engaging video lectures with quizzes, discussion groups and social interactions between student and professor, as well as selectively integrated multimedia assets from HISTORY® Channel, this course has been created to offer a singular and collaborative learning experience to a wide range of students. At $500, the competitively-priced course for college credit targets current college students seeking to meet their graduation requirements, as well as high school students who wish to jumpstart their college education. The Janux platform, a new interactive learning community created by OU, allows students to complete the course anywhere and anytime. For $250, the course also targets lifelong learners, who'll have the unique opportunity to enjoy a world-class education from one of the country's top institutions of higher learning and pioneer in online courses, as well as HISTORY® Channel, one of cable's best known brands and a leader in cross-platform history education. Upon successful completion of the for-credit course, students will receive three transcripted college credits and a badge of course completion. "This course, combining the best in education and entertainment, brings together the resources and talents of a flagship state university and a national television network to present new ways of learning about the past," said Professor Gillon. "With this course, we hope to spark the imagination of a new generation of students, ignite their interest in the study of history, and inspire them to learn more about how the past shapes the world we live in today." "We're excited to make this dynamic and innovative course available for credit, and to be the first media company to offer this opportunity," said Dan Suratt, EVP, Digital Media, A+E Networks. "HISTORY has a legacy of presenting stories from our nation's past in compelling, entertaining and groundbreaking ways to new generations. We are proud to partner with Steve Gillon, who is an inspiring and brilliant history professor, and with the University of Oklahoma, one of the nation's top public universities to bring a world class multi-media education experience that is accessible to students worldwide as well as history enthusiasts." Said President Boren, "When The University of Oklahoma's tradition of academic excellence is combined with the storytelling ability and content from HISTORY Channel, students everywhere will have an opportunity to enroll in a new, high-quality course that is designed to be interactive and engaging. This is also an opportunity for students around the world to earn college credit at a reasonable cost. The first course being offered is U.S. History, but our intent is for the number of courses offered to continue to grow. Through this partnership, we are working to help lower the cost of education for college students, while extending new opportunities to lifelong learners everywhere." 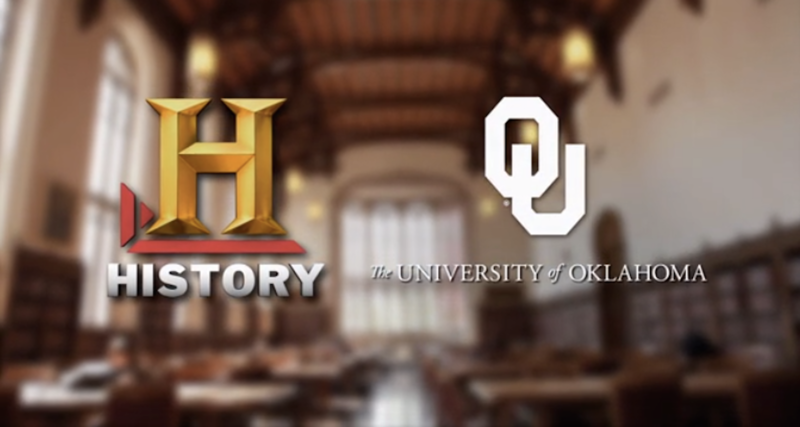 Additional courses from HISTORY® Channel and OU are currently in the works for upcoming semesters. For more information, go to History.com/courses. Janux is a new interactive learning community created by the University of Oklahoma. Janux connects learners and teachers through high-quality courses. Built in partnership with Oklahoma technology leader NextThought, Janux pioneers the field of social learning and is the first of its kind. With Janux, students are able to use interactive learning tools and collaborate with other students and professors in real time. Videos, tests, quizzes and other learning resources are integrated in on online space. For more information, visit Janux.ou.edu.